December is upon us! With all the festivities, events, and end-of-year planning, it can be easy to let your social media presence slip. You’re the life of the real party, who cares about Facebook! Well, your followers certainly do, and now is the perfect time to boost your engagement and share some great personal content. 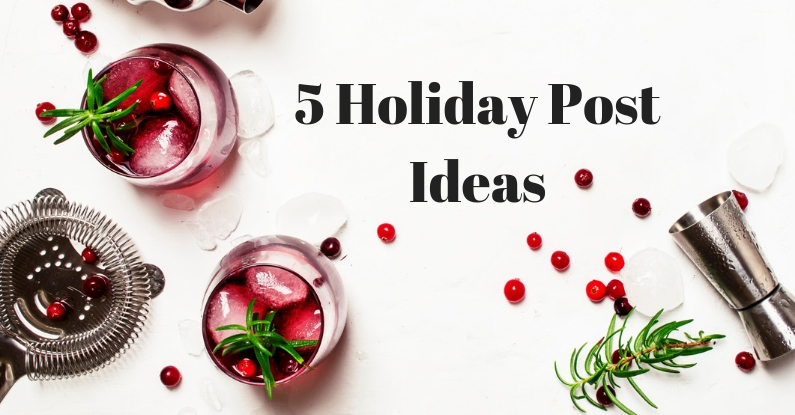 To help you get rolling, I have five post topics that can keep your timeline festive, and your followers engaged! If it’s one thing we can glean from election season, it’s that people have opinions, and nothing sparks engagement like asking for those opinions on a semi-public platform. So this holiday season, why not face off two classic holiday films (Die Hard vs. Home Alone is one of my favorite battles), ask people to determine what is the ultimate Thanksgiving Day pie (it’s pecan if anyone asks), or find out people’s preference for real or artificial trees this holiday season. In the comments, you can even encourage people to tell you why they made the choice they did! Algorithms are now favoring interactive engagement, so likes simply won’t go the distance. Polls are a great way to create an active post, with a simple ask. I know I’m not alone when I say my credit cards see more action than my treadmill at this time of year. It’s easy to get swept up into giving (whether it’s presents, donations, or hosting parties), and while I’ll never knock a donation, at this time of year things get overwhelming pretty quickly. So why not take a few moments to give your clients some friendly financial reminders this holiday season? Whether it’s budget advice, a quick reminder that your long-term financial goals supersede any fad Christmas gift, or a quick reminder that there are more ways to give than from your wallet, people always appreciate knowing someone has their best interest at heart. But be cautious. This is a festive season. Don’t drag the party down by admonishing people about their financial choices. Share a great budget tool or provide a unique gift suggestion, such as a local subscription package that can lighten the holiday burden. While perhaps your grandma’s heirloom sugar cookie recipe should stay off the internet, any of those favorites from Pinterest are a great starting point for posts. Perhaps you’re known for bringing chocolate bark to the office during the holidays, or people can’t get enough of your show-stopper stuffing. But don’t worry if cooking isn’t your thing. At this time of year, the internet is teaming with recipe collections you can share to help inspire your clients. Perhaps it’s as simple as reading The Night Before Christmas to your children (even if they’re 35), or it’s a Griswold tree extravaganza—but everyone has holiday traditions. Let your followers and clients in on a piece of who you are this holiday season by sharing one of these moments. If you have old photos or new ones, share those too! Embrace the holiday seasons for what it is—a time to spend with those you love. So why not give your clients one more reason to love you? During the holidays, there is a myriad of events taking place all over your town (I don’t even need to know where you live to assure you of that). So get sharing! Let people know where you or members of your team spend their time celebrating. Perhaps you’ll enjoy extra face-to-face moments with some of your clients or support a local event that might return the favor someday. Regardless of the outcome, now is the time to highlight your community. You also have the option of sharing some amazing local businesses, whether they’re having a sale, pop-up shop, or they simply make an amazing product, let your audience know. It’s the season of giving and that includes Facebook sharing. Whatever you end up posting this holiday season, just remember that people care about you. So don’t be afraid to share your family Christmas photo or a few phone snaps from your latest event (for more on how to take quality smartphone pictures, check out my 3 Tips to Capturing Captivating Images). Most importantly, have a wonderful holiday season! For more information on getting social this holiday season, check out our latest podcast episode Getting Holiday Social with Kaley Lewis!